This weekend a familiar local art institution is opening in a fresh space, under a new name. On Saturday, Sept. 9 The Institute of Contemporary Art, Los Angeles (ICA LA), formerly known as the Santa Monica Museum of Art (SMMoA), will open the doors on a new 12,700-foot facility located on the south side of the Arts District in Downtown Los Angeles. ICA LA’s new digs include 7,500-square-feet of exhibition space, a designated area for public programs, plus offices. Still yet to open is a cafe, which is scheduled to arrive sometime in 2018. And here’s the part you’ll want to note: Admission, both for the opening celebration and ongoing visitation, is free! “now I’m going to tell you everything” is the inaugural project for ICA LA’s courtyard wall on 7th Street. Photo by Brian Champlin / We Like L.A.
After opening in 1984 SMMoA had spent it’s final 17 years as a tenant of Bergamot Station before shutting down in May 2015. For the past two-plus years former employees of the museum have been focused on looking for a new home, along with a strategy to rebrand and generate the operating funds necessary for a new endeavor. Now, all the hard work has come to fruition. ICL LA has defined it’s mission as to “support art that sparks the pleasure of discovery and challenges the way we see and experience the world, ourselves, and each other,” according to the museum’s new website. – Martín Ramírez: His Life in Pictures, Another Interpretation features approximately 50 drawings and collages as part of the artist’s first presentation in Southern California. 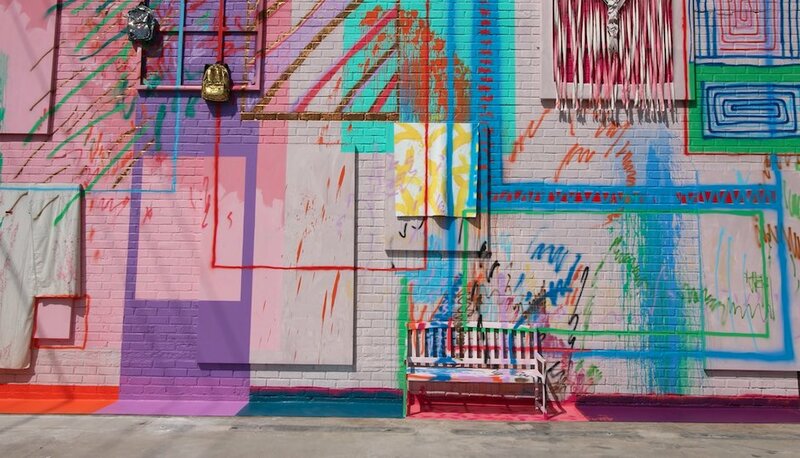 – Sarah Cain: now I’m going to tell you everything is the inaugural project for ICA LA’s courtyard wall on 7th Street (see photo above). – Abigail DeVille: No Space Hidden (Shelter) will be the artist’s first solo exhibition in Los Angeles. Additionally, the opening weekend of Sept. 9-10 includes several special activities, tours and talks to welcome the public to the new space. Bilingual guided tours of Martín Ramírez: His Life in Pictures, Another Interpretation at 1, 2:30, and 4 p.m.
Matchsticks and Mashed Potatoes workshop on collage drawings and alternative image-making in the spirit of Martín Ramírez from 11 a.m. to 5 p.m. Performance by Los Jornaleros del Norte (The Day Laborers of the North) at 5 p.m.
Migrar storybook reading and art workshop with Spanish-language children’s bookstore LA librería and Book Arts LA from 11:30 a.m. to 1:30 p.m.
A conversation with leading scholars of Latin American art and culture: James Oles, Rubén Gallo, Josh Kun, and conservator Harriet Stratis, moderated by Elsa Longhauser, discussing the life and work of Martín Ramírez from 2 to 3:30 p.m.
An interactive dance class by Cambalache, featuring Maestro Cesar Castro, Xochi Flores, Chuy Sandoval, and Juan Perez from 4 to 5 p.m.
ICA LA is located at 1717 E. 7th St., Los Angeles, CA 90021. Opening weekend (Sept. 9-10) hours are from 11 a.m. to 6 p.m. Ongoing hours thereafter will be 11 a.m. to 7 p.m. on Wed. – Fri., and 11 a.m. to 6 p.m. on Sat.-Sun. Admission is free. For more information on visiting ICA LA, or to help plan your visit, be sure to visit theicala.org.